wondering what a day at Camp looks like? you have come to the right place! 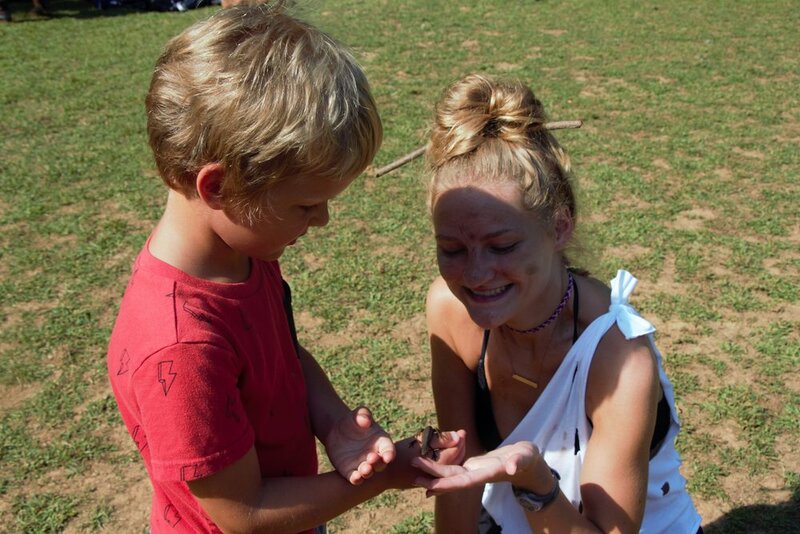 Arrival days at Camp are filled with LOTS excitement, some hustle and bustle and may feel busy to the new camper! There will be many returning campers and old friends seeing each other for the first time in a year. Each year there are many new faces too! Whether you are a new or returning Camper, you will always be warmly greeted by our Staff who can help you with your gear and send you to the Check-In table. Once your Camper is checked-in, come on into the Country Store to grab your Campers tee-shirt. Our Camp Trucks, along with your Camper's gear will be waiting just outside the Country Store once you are ready to take you up the hill and find your Camper's cabin! If your Camper is staying for consecutive weeks, there is no need to come and pick them up just to re-check them in again! Your Camper can stay for the weekend and laundry and meals will be provided for them. Saturday after check-out, cabin cleaning happens early followed by a long stretch of afternoon rest. Late Saturday afternoon is for a fun camp-wide activity followed by an all-Camp cook-out and free swim time. Sunday morning after breakfast, Campers who have stayed for the weekend gather in the pavilion for "Camp Church". Camp Church is where we sing some classic camp songs, where Campers and Staff can play music, and a chance for Staff to share Camp experiences or stories and why Camp is special to them. Camp Church is non-religious nor is it affiliated with any Church. We welcome anyone who has dropped off your Camper to chat with any of the Staff, ask questions, walk around, check out the Lodge where we eat meals, see your Camper's cabin, and even help your Camper set up their bunk for the week. All cabins will have counselors waiting for their campers to arrive and are there to help everyone get settled in, answer any questions, and make everyone feel a little more comfortable! Your Camper, along with gear will be waiting at the bottom of the hill for pickup. Parents, guardians and only those with written permission can check our your Camper. The majority of Camp activities are organized in a way that your Camper stays with his or her cabin throughout the day. At no time will they be left by themselves or left behind! Activities change each day and vary each week, and each week has it's own special theme! We do encourage each Camper to try all our activities, however your Camper is free to observe and remain part of the group at any time. Camper's can elect to have a "Secret Pal", a buddy they write fun notes or silly jokes to throughout the week. Friday night after dinner is filled with excitement as we host a Camp dance in our Pavilion. Our Staff uses a daily schedule as a guideline to help plan activities and fun things for all of our Campers. The schedule we use allows for a nice balance of busy fun and free time, but also sets a comfortable rhythm for the Campers early on their week that they quickly adjust to. Our schedule is flexible and is not set in stone, as we allow for our Staff to dream up creative ideas or activities for the Campers and bring them to life! Each day the Camper's daily schedule is posted outside of the Lodge on our Camp bulletin board. After breakfast, Campers can check their cabin's planned activities before heading to their cabins to do quick cabin clean-ups and get ready for their day! We do our very best to provide a well-rounded week for all of our Campers! We take extra care in considering ages, individual abilities, and any additional health concerns while planning our activities each day. lake and river swimming, canoeing, creek wading, water + beach play, team building, nature walks, hiking, critter hunts,arts + crafts, music, dancing, skits, campfires, cabin camp-outs, cook-outs, camp yoga, fishing, archery, horseback riding, basketball, street hockey, volleyball, ultimate frisbee, milk jug lacrosse, tetherball, shelter-building, spikeball, can-jam, soccer, capture the counselor, capture the flag, and more! Each camper is required to pass a basic swim test at the start of the week. Please let us know on your Camper’s Health Form if your child is NOT able to swim independently. If there are any circumstances that your child shouldn’t participate in any of these activities please let us know on your child’s Health Form or during check-in. Many activities here at Camp have been created over the years by our Staff, which are entirely unique to Camp Varsity. A lot of these activities have become somewhat legendary around the mountain! There is a good chance you may hear your Camper mention a few after his/her week at Camp: The Game, Scott Kelly, Baird Ball, GLOW, Rambo and Wolf are a few infamous activities! Theme days create a LOT of buzz, energy and fun for everyone at Camp! Staff members get a chance to be creative and plan special activities centered around the theme. Theme days typically happen toward the end of the week. Some themes that have happened in previous summers: Fairy Tale Week, Battle of the Bands, Monopoly, Olympic Week, Beach Week, Country Fair, and Decades Week to name a few! Throughout the course of the week, most cabins will travel out of Camp to a local hiking or swimming spot. Camp Varsity Campers and Staff are regular visitors at Shenandoah National Park. We hike to White Oak Canyon, hike and swim in the Rapidan River, and a frequently visit a local favorite watering hole in the Robinson River, "the Swinging Bridge" for wading and swimming. Depending on the weather, a cabin may also have the chance to hike the very popular Old Rag Mountain, in Shenandoah National Park. If you are interested in our offerings at the Camp Store check out our Food + Meals! The Camp Store is THE gathering place during the day between activities! Once in the morning and once in the afternoon, Campers take a “break” at our Camp Store. Break is free-time in between planned activities and is a chance for Campers to snack, hydrate, fill up water bottles, and hang-out with all of the folks here at Camp. Campers and Staff love this free-time: impromptu skits, music + singing, and all kinds of creative fun has been known to happen during Break! Some Campers also choose to jump in on tetherball, horsehoes, spikeball, playing can-jan, and throwing frisbees.